It’s full of Simcoe and Amarillo with notes of citrus, melon, and peach. It packs a punch. Finishing bright and crisp with a refreshing bitterness. Inline was originally going to be called Rollerblade in honour of Dr. John Kitchin – aka Slomo – who spends his days skating in slow motion along the San Diego boardwalk. 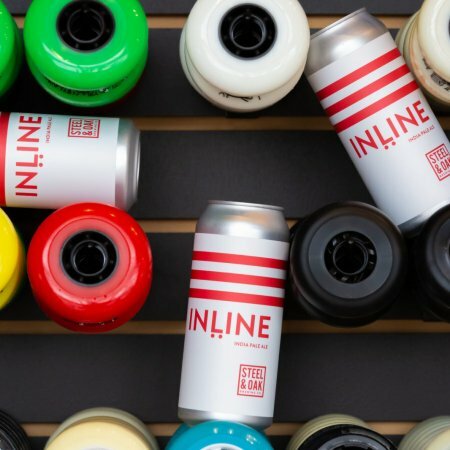 But since Rollerblade is the name of a specific brand of inline skates, Steel & Oak changed it at the last minute to the non-trademarked option to avoid any legal difficulties. Inline IPA will be available soon in 473 ml cans at Steel & Oak and select private liquor stores. For more details, see the full release announcement.